Are you still worrying about the difficulty on falling asleep? This sleep eye mark will be your best resolution, helping you enjoy the complete dark zone that is responsible for deep sleep. Of course, it takes a while before one gets used to eye covers. Would you like to enjoy to peaceful enviroment while doing yoga or meditation? This sleep blindfold will be your best resolution, providing a gentler and complete covering for relaxation. This soft eye mask features Breathable Nylon Fabric outside, and luxurious memory foam eye cavities inside ensure you enjoying a lightweght and comfortable wearing. 100% Satisfaction Guarantee: 12-Month Warranty; No satisfied ,Free reason for return; Quality problem, please contact us, we will resend you a new one. 【Ideal Helper for Sleeping】- Are you the one who is sensitive to light? If yes, it is very essentail to buy a sleep eye mark in order to get into sleep rapidly. This sleeping blindfold can completely block the light out, helping you fall asleep when you would like to take a nap on airplane, train, long-distance bus, office and camping. 【Comfort & Skin-Friendly Material】- Made of high quality smooth and breathable Nylon Fabric material outside and high quality memory foam inside, this sleep eye cover is ultra soft, flexible and comfortable. Its smooth fabric let you release your facial stress and its memory foam features a protective curve which will not touch your eyelids, reducing eye fatigue and no pressure on your eyes. 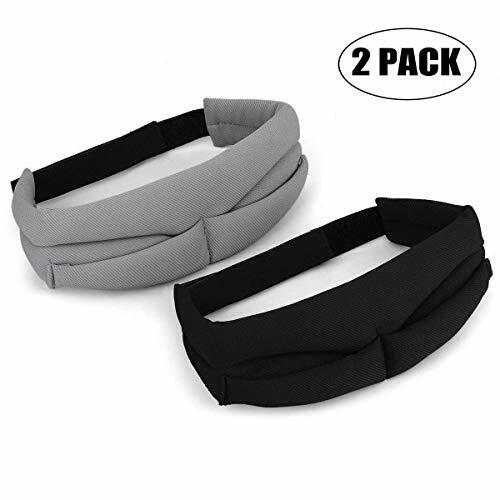 【Adjustable Strap】- the strap with velcro closure (about 25 inch perimeter) which can be easily adjusted to fit different size of facial contour does not move or fall off while you're sleeping, giving a firm fit and easing any pressure of the mask thus allowing free eye movement. Very easy and convinient to wear. 【Wide Application】- Good sleeping aid for the people who suffer insomnia during night sleeping; enssential accessory for the people who is sensitive to light but would like to take napping on travel, office, airplane, train, long-distance bus; perfect relaxing aid when you are doning yoga or meditation.